Are Partial Dentures Right for You? A “partial” is a term most people use to refer to a partial denture. 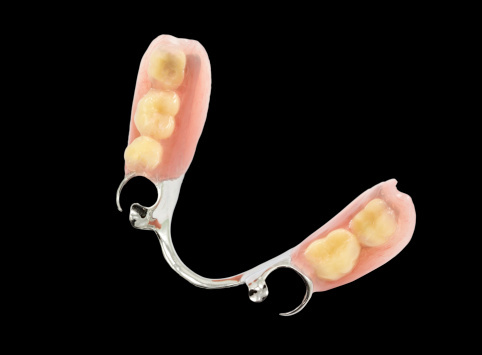 Dentures are custom-made prosthetic teeth, usually attached to a gum colored plastic plate. If you are missing more than one tooth but you have mostly healthy teeth, getting a custom-fitted partial to replace your missing teeth is a good solution. Partial dentures can be set up in multiple ways. It’s important to replace any missing teeth to prevent the shifting and misalignment of your other teeth and to maintain normal oral functions like eating and speaking clearly. If you need to replace your missing teeth, make an appointment with the experienced and attentive dentists of Elmbrook Family Dental today. The dentists at Elmbrook Family Dental proudly serve patients throughout Brookfield, WI, Elm Grove, Milwaukee, Pewaukee, Waukesha, New Berlin and nearby areas. Partial dentures can be either fixed or removable. Removable partial dentures fit in the mouth with metal clasps that hook onto surrounding teeth and require daily maintenance. Fixed partials, also known as bridges, are partials that are anchored to surrounding healthy teeth by a dental bridge. Dental bridges require the surrounding teeth to be shaped and fitted with dental crowns (caps) to allow more room for the bridge and partial denture to fit comfortably in the mouth. Partial dentures can also be attached to a dental implant. Dental implants are tiny titanium rods that replace missing tooth roots and maintain the integrity of the jawbone. Partial dentures attached to dental implants are securely snapped onto the implant but can be easily removed. Although dental implants offer the most benefits, individual medical factors may affect your eligibility to get dental implants. In some cases, removable partial dentures may be the best option. The choice should be made in a consultation with your dentist. Make an appointment with the gentle dentists of Elmbrook Family Dental today. Elmbrook Family Dental currently serves patients throughout Brookfield, WI, Elm Grove, Milwaukee, Pewaukee, Waukesha, New Berlin and surrounding communities. Comments Off on Are Partial Dentures Right for You?